In a double overtime thriller that had fans on their feet, the Comets picked up a hard fought victory against Central Dauphin on Wednesday night. Emily McCoy banged home the game winner for the Comets in the 87 minute, which slates them a semifinal game against Warwick. It also gets them a berth into the state playoffs. 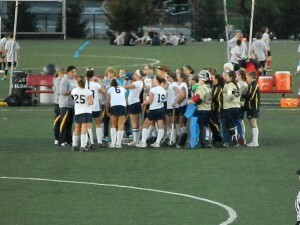 The Comets at halftime during the Cedar Cliff game last week. Photo by Sam Valentin. The lady Comets started off the scoring when Eryn McCoy scored off an assist by Shannon Sloss 14 minutes into the game. But the Rams did not take long to answer when Katie Foran scored just before the half. The game would remain tied for 57 minutes which included some very rough play, pressure, some cards, warnings and even some elbows. “It toughened us up…,”said Penn Manor coach Matt Soto who notched his 501 win. He earned 500 late last week with a win over Cedar Cliff. The Comets will face the LL league Champions, Warriors at Hempfield on Thursday at 6pm. This will be the fourth meeting between the two league rivals with the series being at 2-1, going the Warriors way so far. Both teams picked up a win on the opposing teams field during the regular season but that all changed once the LL league playoffs rolled around. The last meeting between these powerhouses was an overtime thriller full of emotions. It was a crushing defeat at Warwick. This game also crowned the Warriors LL league Champions, a title the Lady Comets wanted. So this game could be another defeat at the hands of the Warriors or redemption for the title they stole from them. The players won’t be joking around once that game clock starts running though. The winner of this game would face the winner of the Hempfield vs. Lower Dauphin game at Milton Hershey Stadium at 2:30 on Saturday. In note, the last time the girls lost the LL league title they took home states. This was 2008 so most of the players don’t remember this but for most seniors its a vivid memory.